Decimo direttore musicale della Chicago Symphony Orchestra dal 2010, Riccardo Muti ha esteso il contratto di Music Director fino alla stagione del 2021-22. Tra il 2020 e il 2022 manterrà l’impegno attuale nella direzione di dieci settimane di concerti in abbonamento, concerti speciali e attività a sfondo benefico sociale a Chicago, oltre a tre/quattro settimane di tour negli USA o all’estero per ogni stagione. Muti became the CSO’s 10th music director in 2010 and his current contract continues through 2020. Muti’s new contract will begin in September 2020 and extend through August 2022. During this period, Muti will maintain his current commitment to lead the Orchestra in 10 weeks of subscription concerts, special concerts and community engagement activities in Chicago, in addition to three to four weeks of domestic or international tours each season. As with his previous contracts, Muti’s role as music director includes a diverse set of responsibilities. 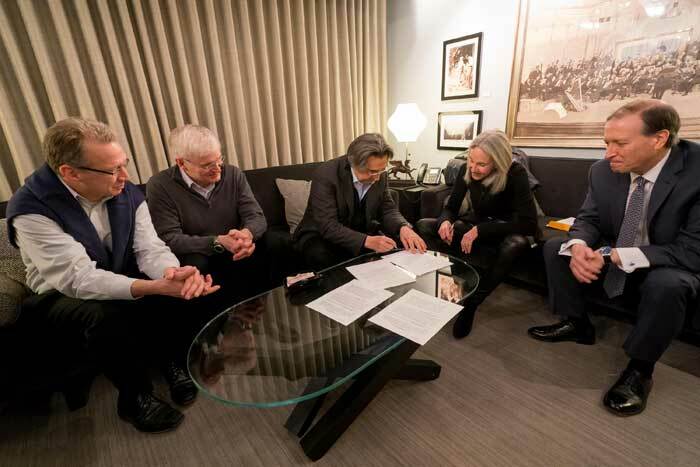 In addition to his subscription concerts and touring responsibilities, Muti also works to maintain the ensemble’s exceptional roster of musicians, participating in auditions for and the selection of new members of the Orchestra. In addition, Muti continues the CSO’s distinguished legacy of recording with releases on the CSO’s Resound recording label. Muti is also responsible for the selection of season programming and regularly features works by CSO Mead Composers-in-Residence, including a March 2017 world premiere by Samuel Adams and September 2017 world premiere by Elizabeth Ogonek, both of whom he appointed to their positions in 2015. Integral to establishing the CSO’s respected Sir Georg Solti Conducting Apprentice Program at the beginning of his tenure as music director, Muti remains connected to activities of each apprentice including current Solti Conducting Apprentice Erina Yashima who was named to the post in 2015. In support of the Negaunee Music Institute at the CSO, Muti will also continue to play an active role in several community engagement and training programs. These include his annual free Concerts for Chicago; interactive recital programs with CSO and guest musicians at area juvenile justice facilities; CSO open rehearsals for seniors, veterans and school and community groups; and free, open rehearsals at Symphony Center during the annual Youth in Music Festival and with the Civic Orchestra of Chicago, the CSO’s prestigious training Orchestra. Since the beginning of his tenure as music director in 2010, Muti, the CSO and the Chicago Symphony Chorus have also reached a global audience through radio broadcasts and projects such as the CSO’s first worldwide live video webcast of Verdi’s Requiem in 2013 and an online streaming video of Beethoven’s Ninth Symphony which has been viewed by more than nine million people around the world on the CSO’s YouTube channel since it was posted in May 2015. Riccardo Muti made his debut with the Chicago Symphony Orchestra in 1973 at the Ravinia Festival. In 2007, after an absence of more than 34 years, Muti led the CSO in a month-long residency which included subscription concerts and a critically heralded European tour which included the CSO’s first appearances in Italy in more than 25 years. Muti’s appointment as the CSO’s 10th music director was announced in 2008. He appeared with the Orchestra several times as Music Director Designate beginning in January 2009 and officially stepped into his role as Music Director on September 19, 2010, leading the CSO in a concert which attracted 25,000 people to the Pritzker Pavilion in Chicago’s Millennium Park. Since 2010, Muti has led seven international tours with the CSO including an 11-concert Asia tour in 2016 with sold-out performances in Taiwan, China, Japan and South Korea and the critically acclaimed 2017 European tour which featured performances that marked the CSO’s debut in Hamburg, Germany at the new Elbphilharmonie and concerts at Milan’s Teatro alla Scala which represented Muti and the Orchestra’s first appearances at the venue together. Muti and the CSO have also made regular appearances together at New York’s Carnegie Hall including the most recent performances in 2015 of Prokofiev’s Alexander Nevsky with the Chicago Symphony Chorus. The 2017/18 season includes two domestic tours for Muti and the CSO with a critically acclaimed tour in October 2017 to Kansas City and the U.S. West Coast and an upcoming tour to the East Coast in February 2018. The West Coast tour included the Orchestra and Muti’s debut at Walt Disney Concert Hall in Los Angeles, and the East Coast tour will feature the first appearance for Muti and the Orchestra together at the John F. Kennedy Center for the Performing Arts as well as a return appearance at Carnegie Hall. These tour performances in 2017/18 add to the Orchestra’s distinguished touring history, which began in 1892 and includes 60 international tours. Muti’s CSO Resound recordings number eight to date and include his 2010 debut release of Verdi’s Requiem which garnered two Grammy awards; his 2013 release of Verdi’s Otello which won the 2014 International Opera Award for the Best Complete Opera; the Grammy-nominated 2016 world premiere recording of Mason Bates’s Anthology of Fantastic Zoology; and the most recent, critically acclaimed release of Bruckner’s Symphony No. 9 in 2017, which was selected by The New York Times as one of the best recordings of the year. Regularly attracting critical attention and capacity audiences to his subscription concerts with the CSO at Symphony Center in Chicago, Muti’s programming highlights since 2010 include performances of Verdi’s Requiem, Otello, Macbeth and Falstaff; Prokofiev’s Alexander Nevsky and Ivan the Terrible; the complete symphonies of Schubert, Brahms, Tchaikovsky and Scriabin; Beethoven’s Ninth Symphony; many works of the classical, romantic and modern repertoire; and a survey of works which received their U.S. or world premiere by the CSO as part of the Orchestra’s 125th season in 2015/16. Muti’s commitment to connecting all Chicagoans to the CSO has resulted in free, annual community concerts that have taken place in locations throughout the city including Millennium Park, Morton East High School in Cicero, Apostolic Church of God in Chicago’s Woodlawn neighborhood and Lane Technical High School in Chicago’s Roscoe Village neighborhood. Muti’s appearances with the CSO in the Chicago area also extend to performances included on the CSO’s new annual concert series at Wheaton College’s Edman Memorial Chapel, where Muti’s debut at the venue in March 2017 attracted a capacity audience. During his tenure as music director, Muti has also led the CSO in nearly 40 open rehearsals at Symphony Center with more than 20,000 members of the community having attended. In 2014, the CSO’s music director position was endowed in perpetuity by a generous gift from the Zell Family Foundation.